Instant downloads of all 942 LitChart PDFs (including The Devil in the White City). Olmsted begins to lose his mental functions, and fears that he’ll be confined to an asylum. Sinking deeper into dementia, he nonetheless remembers designing the World’s Fair grounds, and angrily says that his plans weren’t carried out correctly. He dies on August 28, 1903. His funeral is small, and his own wife doesn’t attend. Olmsted’s final years are both tragic and morbidly amusing — though he’s slowly losing his mind, he continues to complain about the details of his landscape designs. Just as Mayor Harrison was energetic and forceful even on his deathbed, Olmsted was exacting and painstaking even in his final years. There is also a sense in which Olmsted’s near maniacal focus on what he cares about shares some similarities of single-minded intensity with Holmes far more awful passion. Olmsted’s focus on his work seems to have wrecked his own personal life. The Ferris Wheel makes a great deal of money, but when it’s taken down in 1894, imitations spring up everywhere. Ferris divorces his wife in 1896, and dies of typhoid only a few months later. The original Ferris Wheel is torn apart in 1906 and made into scrap iron. When it’s demolished, it doesn’t collapse, as the demolition team has supposed, but turns slowly, one last time. As we come to the end of the book, Larson contrasts the extent of the WF’s legacy and speed with which the WF itself is forgotten. In this way, the image of the Ferris Wheel spinning one last time is immensely poignant; though the wheel itself is quickly destroyed, its fame lives on. In the same way, Ferris himself dies shortly after the WF, but his legacy as an engineer lives on. Sol Bloom, the chief of Midway, has become a rich man following the success of the World’s Fair. He invests in food shipment companies, but goes bankrupt when the railway workers go on strike. He isn’t discouraged at all; he buys two good suits, and eventually becomes a congressman and one of the founders of the charter of the United Nations. Of all the characters in the book, Sol Bloom may be the person who best understands how to survive in modern America. Bloom is impressive, flashy, and talented at keeping up appearances. The fact that he goes from organizing lewd shows at the WF to drafting the charter of the United Nations underscores how important appearances are to politics, and to being successful in the modern world. Buffalo Bill makes almost a million dollars from his Wild West show. He founds the town of Cody, Wyoming, buys a newspaper, and alienates his wife by conducting a long affair with a young actress. In the Panic of 1907, he loses almost all of his money, and is forced to perform at circuses, even though he’s more than seventy years old. He dies in 1917, too poor to pay for a burial. 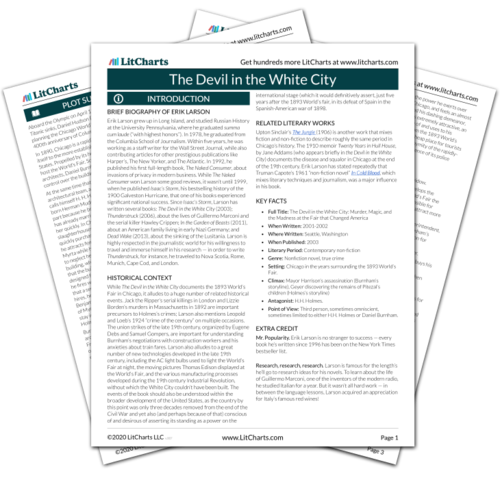 Buffalo Bill’s fortunes rise and fall throughout The Devil in the White City. Unlike many of the other master showmen in the book, Bill doesn’t die rich. The financial recession of 1893 proves how quickly money can be made and then lost, and ultimately, Bill is a victim of the changes in the American economy. Theodore Dreiser marries Sara Osborne White, and cheats on her frequently. Dora Root, John Root’s widow, remains enormously depressed in the years following his death. She had loved her husband and enjoyed the creative stimulation of being married to him. She writes a long letter to Burnham in which she explains that she is proud of her life, but still full of self-doubt and conscious that “all would have been different” had John lived longer. Dora Root exemplifies the contradictions in the WF. She’s both proud of her husband’s achievement in designing the Fair and saddened that the Fair claimed his life by overworking him. One of Larson’s projects in writing The Devil in the White City is to pay attention to both sides of the Fair: the humans who risked everything to build it and the legacy they created, and the human cost of that creation. Prendergast is tried for Harrison’s murder and prosecuted by Alfred S. Trude, the same man to whom Prendergast had sent letters. Prendergast pleads insanity, but Trude points to the care Prendergast took to keep an empty chamber in his revolver in case it went off unexpectedly. Prendergast is sentenced to death, but Clarence Darrow intervenes and gets Prendergast a sanity inquest. The inquest fails, and Prendergast is executed. Years later, Darrow defends two other Chicago murderers, Leopold and Loeb, two wealthy college students who conspired together to try to commit the “perfect” crime. Prendergast’s death sentence may be justified, since he’s dangerous and clearly contemplated murder ahead of time. Yet it’s also brutal and vengeful, encapsulating the principle of “an eye for an eye.” The implication is that the people in power in Chicago are guilty of brutality and bloodthirstiness of the same kind exemplified by the criminals in Chicago. The allusion to Leopold and Loeb, two wealthy, educated men who killed a younger boy in an effort to pull off a “perfect crime”, emphasizes the point that the violence in Chicago can’t easily be restricted to any one group of people. In New York in the early 20th century, Farida Mazhar jumps out of a cake, naked, at the Waldorf-Astoria hotel. Mazhar had belly danced at the World’s Fair. Perhaps one of the most important legacies of the WF was its emphasis on public sexuality. As Mazhar’s later career demonstrates, America was all-too willing to indulge in entertainment of the kind she offered. Arn, Jackson. "The Devil in the White City Epilogue, Chapter 2: Recessional." LitCharts. LitCharts LLC, 1 Jul 2015. Web. 18 Apr 2019. Arn, Jackson. "The Devil in the White City Epilogue, Chapter 2: Recessional." LitCharts LLC, July 1, 2015. Retrieved April 18, 2019. https://www.litcharts.com/lit/the-devil-in-the-white-city/epilogue-chapter-2-recessional.